I constantly have projects in various stages of completeness. I thought for today's post I'd visit one of those projects in progress. I love leaf pressing. This may come as no surprise if you happened to catch one of my previous projects inspired by an Orangeola Japanese Maple. When I posted the photo of the tree in bloom, I thought that it was a Western Redbud. Once the leaves emerged it turned out to be a Forest Pansy Redbud. 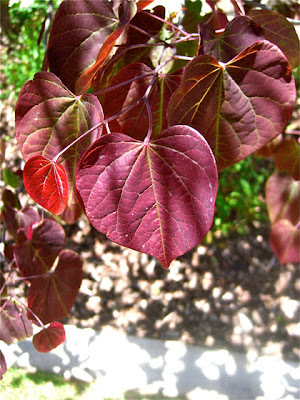 The leaves are a gorgeous purple red and perfectly heart shaped. How could I not try and save some of these beautiful leaves? I picked several leaves (there were way too many to choose from) and went ahead and prepped them for pressing. I started by washing the leaves and then drying them on a paper towel. Pressing is easy after that. I like to do it old school. I slipped the leaves between the pages of one of my large coffee table books and then added on a lot of weight. Another valuable lesson brought to you from my elementary school education. So, there they'll stay for now while the Complete Works of Shakespeare works its magic. I have so many ideas of how to use the leaves once they are fully dry. Simply framed would be beautiful, but can't you see one of those beautiful leaves as the center piece on a Valentine's Day card? I can. Hey MJ! Thank you for commenting on my blog, it makes me super happy :) I hope you like the swaddle dolls. I haven't pressed flowers (or leaves) for ages. Those really are lovely leaves you found, I am excited to see how they turn out. I do have a question though, when they press, will the plastic sheets keep the moisture in? I thought pressing was simply letting them dry while being squished. Maybe I'm wrong, I hope I am, because I would love to see how you use them! Hi- Thanks for dropping by. Your brain works faster than mine. I realized that moisture might be a problem after a day or so and took the leaves out of the bags before it ruined them. It was a "oh duh" moment. I have a lot of those.